Purple coneflowers are popular perennial flowers with blooms that resemble daisies that surround a large, dark center cone. 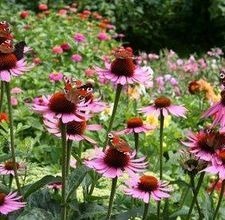 Purple coneflowers are also popular with butterflies and hummingbirds and will attract an abundance of these interesting visitors to a garden. These tall, showy flowers will bloom from late in the summer until well into autumn. Learn how to plant purple coneflowers and add this beautiful perennial flower to a sunny flowerbed. Choose purple coneflower plants growing in 4-inch diameter transplant pots for best results. Purple coneflower plants this size will be large enough to have a sufficient head start for the first growing season. Select a growing area that receives full sun. Purple coneflowers will bloom best when they receive at least 6 hours of sun each day. Prepare the soil in the growing area. Add approximately 4 inches of compost to the soil and work it in well with the garden spade to completely incorporate the compost. Add the fertilizer in the recommended amount for the garden area size (2 lb. for each 100 square ft. of soil) and work it into the soil. Dig holes that are deep enough and wide enough to fit the roots of the plants. Place the coneflowers into the soil at the same level as they were growing in the pots. Place the coneflower plants so that they are between 18 and 24 inches apart. Water regularly if the weather is dry. Purple coneflowers are generally drought resistant; however, newly planted coneflowers need regular moisture.